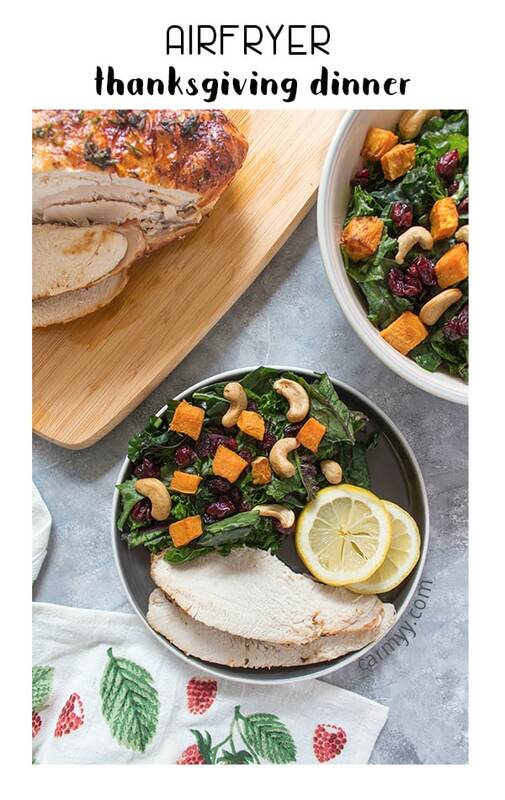 Looking to make a simple turkey dinner for a small group of friends or family? 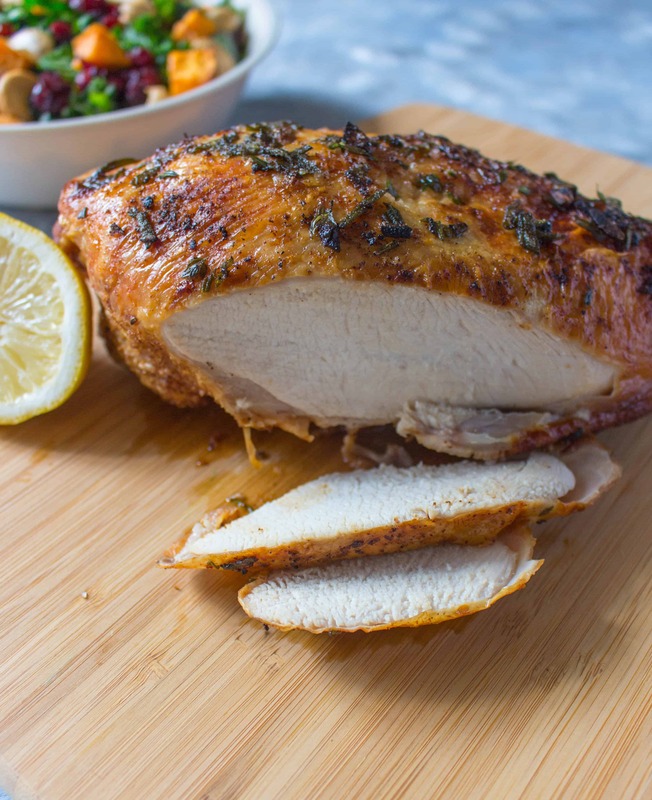 Try this simple air fryer turkey dinner made with the Philips XXL Airfryer. Holiday season is upon us and I for one am excited to get my fair share of turkey in my belly. I didn’t grow up with huge holiday dinners – we mostly just focused on getting everyone together for a meal. This is something that I’ve brought to every holiday meal since. A simple meal featuring some turkey and we are all happy, together. 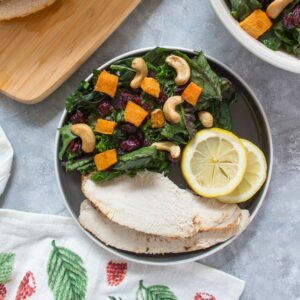 This year, I decided to make a simple but delicious turkey dinner in the airfryer because I wanted to keep things easy and not be slaving away in a hot kitchen, panicking in the grocery store with a long list, and just being stressed out in general for the days leading up to the holidays. 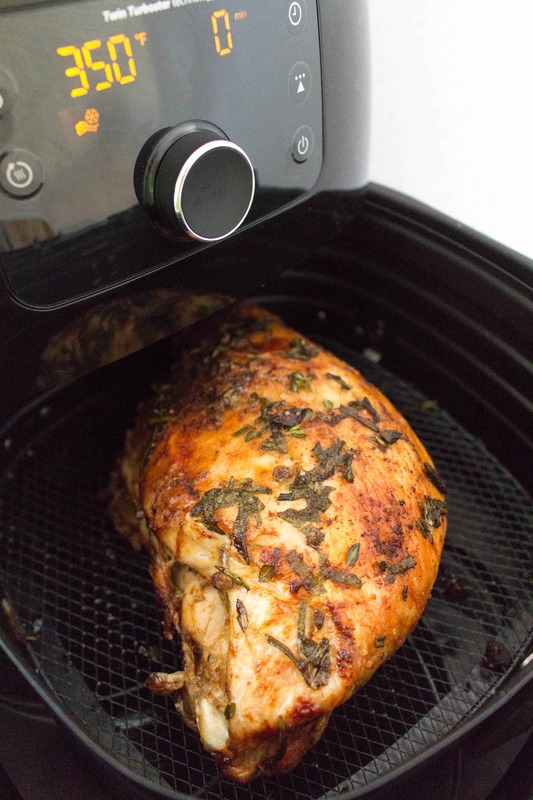 Plus, making a turkey breast in the airfryer is perfect because there’s no pre-heating necessary, and I don’t have to constantly check on a whole turkey in the oven or clear out the fridge to get a turkey to fit inside for the thawing process. This year, I made a turkey breast (bone in, skin on, just over 1 kg) in the airfryer alongside a sweet potato and kale salad as a test run for Thanksgiving. Since it’s just the 5 of us, this was the perfect amount of food. The Philips XXL Airfryer cooks your meal four times faster than an oven so the turkey itself only took an hour to cook with a minimal amount of oil! For this simple turkey dinner, I used the Philips XXL Airfryer. 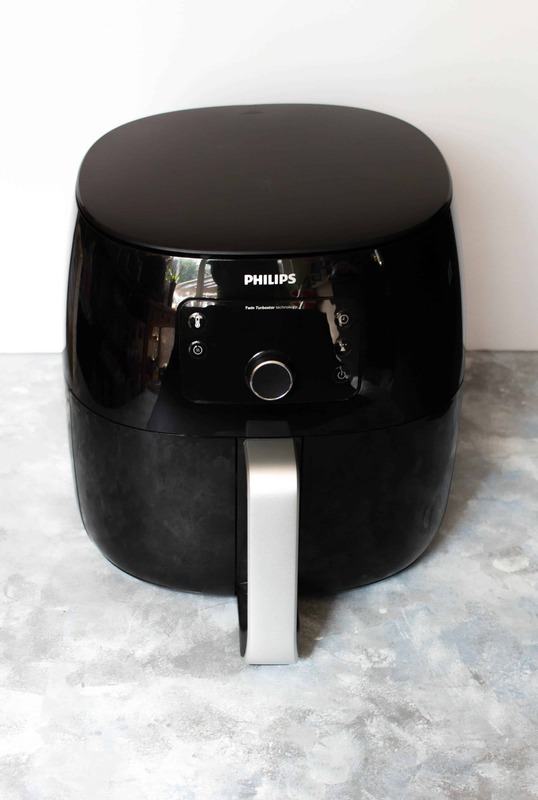 The largest Airfryer in the Philips collection, it has a 3 pound capacity, which means that it can easily handle a whole chicken (or up to two bags of fries) allowing you to prepare up to 6 portions of food in one appliance. It also uses powerful hot air to fry your favorite food with a tablespoon or less of oil and removes excess fat from the food, capturing it all in the bottom. I started off by cutting up 2 sweet potatoes into little cubes for the salad. I gave them a light coating of olive oil, garlic powder, salt and pepper. 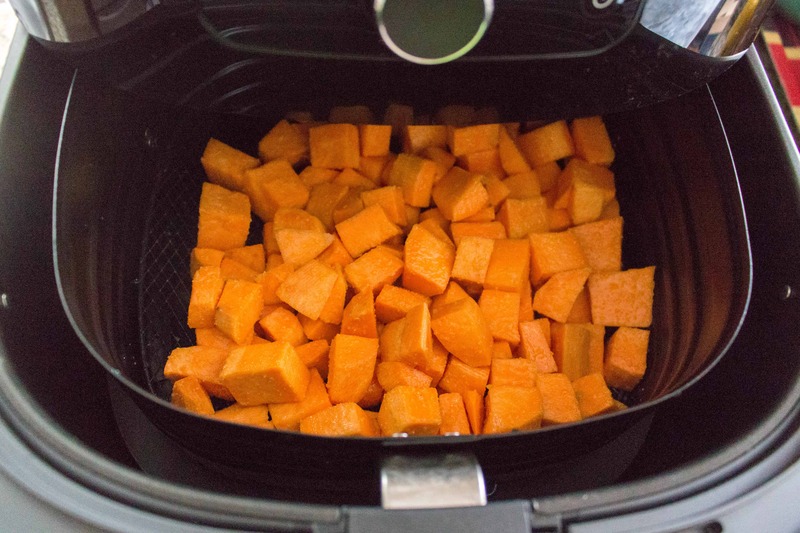 It should take 15-20 minutes in the airfryer depending on how large your sweet potatoes were. It took me 17 minutes at 350F. I popped it all into the Philips XXL Airfryer and while it cooked, I got started with the turkey. In a bowl, I mixed together olive oil, lemon, salt & pepper, paprika, mustard powder, garlic, sage, thyme, and rosemary. With a brush, I coated the entire turkey with the mixture then sprinkled in a little extra bit of salt on top for good measure. With the turkey coated, I let it “marinate” while the sweet potatoes cooked. Once the sweet potatoes are done, clear out the basket and place the turkey breast in the airfryer basket skin side down. Airfry the turkey breast for 30 minutes on 350F before taking it out and flipping it over (skin side up) and keep it inside for another 20 minutes. While the turkey is cooking, I massaged around 8oz of kale with some olive oil for the salad and made some salad dressing with lemon zest, lemon juice, garlic, and olive oil. Then I mixed together the kale, sweet potato, half a cup of cashews, and half a cup of cranberries. Note: I’d recommend getting a meat thermometer to check the internal temperature of the turkey to ensure that it is cooked all the way through. This turkey breast was a little over 1kg and it took a total of 50 minutes in the airfryer to be cooked through. Cooking the turkey breast in the airfryer, it came out so moist and juicy! Airfrying just the breast, I didn’t have to worry about covering parts of a whole turkey to prevent it from drying out while the rest of the turkey cooked through. It was also the perfect amount for the handful of us. 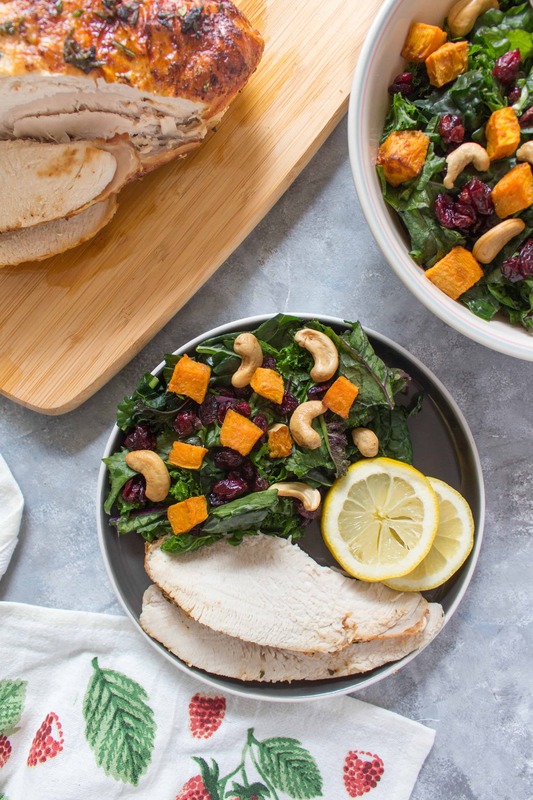 From start to finish, making this simple turkey dinner in the airfryer took under an hour and a half! 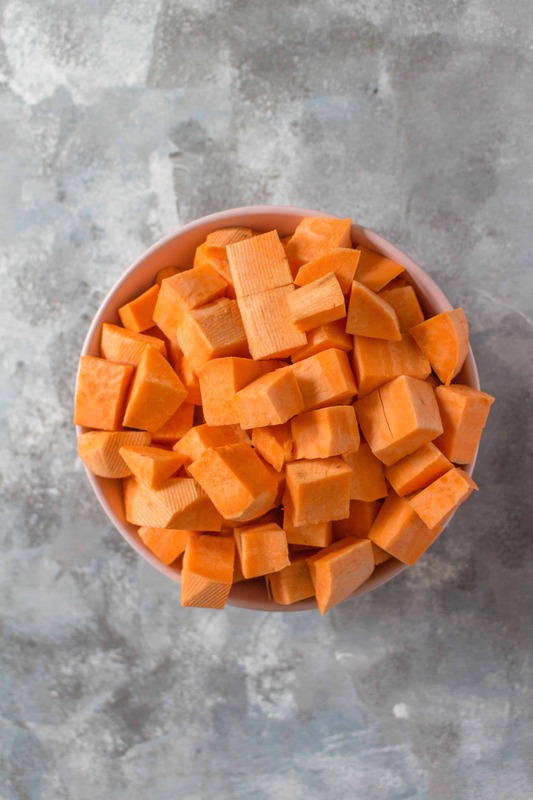 Started off by cutting up 2 sweet potatoes into little cubes for the salad.Give them a light coating of olive oil, garlic powder, salt and pepper. Place into the Philips XXL Airfryer at 350F for 15-20 minutes. While the sweet potato cooks, mix your olive oil, lemon juice, and seasoning together and brush onto the turkey breast. 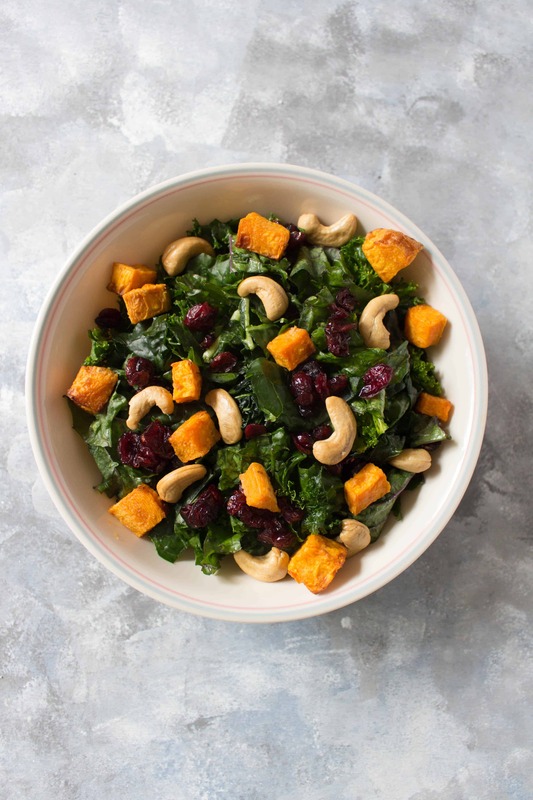 While the turkey is cooking, massage the kale with some olive oil for the salad and then mix together the kale, sweet potato, half a cup of cashews, and half a cup of cranberries. Using a meat thermometer, check the internal temperature of the turkey to ensure that it is cooked all the way through - 165°F (74°C). What a GREAT way to make turkey dinner. Perfect for a small gathering….and for those that don’t want all the work of a HUGE meal prep. We love turkey, so I can make it more often throughout the year this way. My co-workers have been talking up the air fryer. This is fantastic, I love this! 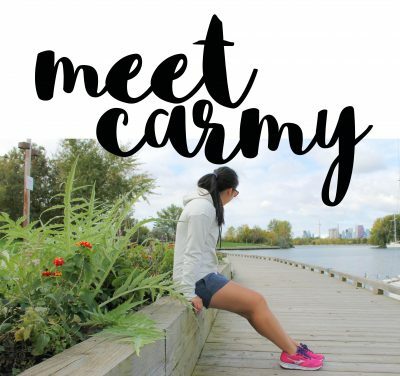 The step-by-step pictures are very helpful, thanks for this great article. I love that this is so much easier than a regular turkey dinner for Thanksgiving. It’s much better to allow for more quality family time. I bet it is so full of flavor too! YES to turkey season!!! I LOVE me some turkey and I’ve never had it made in an air fryer before. But I’ve been seeing more and more recipes with air fryers, so I think it’s time I got one! And if it means more turkey in my life, I’m in! A friend has been raving about her air fryer and I actually had zero interest in it….until I read this post. 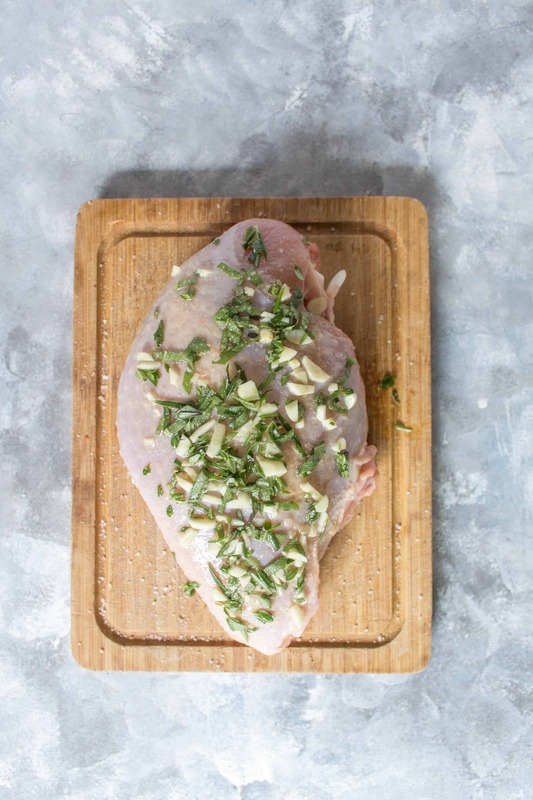 Sounds like the perfect way to make a lot of things, including this turkey breast. Looks both moist and crispy. I’m going to have to reconsider the air fryer. I’ve really been getting into the airfryer lately and I love how juicy poultry comes in it! 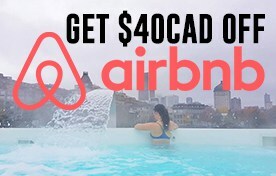 What a great idea to use it for a turkey dinner. It’s so convenient that you can use it for both the turkey and to cook the sweet potatoes! So quick and easy for a smaller group. I’ve not taken the plunge with the air fryer, but this looks like a wonderful meal. I’m also convinced I should buy one, and this will be my first meal. Thanks for the recipe! This is a wonderful way to make a turkey dinner for just a few. The turkey looks so tasty and I do love the seasonings you use. This would be such a great Christmas gift — I’m saving all of these air-fryer recipes. That looks so succulent and juicy! I really need to dig my air fryer out. Mine looks different (doesn’t have a rack), I wonder if this would work. Such a great way to get that crispy fried effect without frying it in all that oil! Wow, I would never have thought to use the airfryer for my turkey, this is genius!! Makes for such a stress-free dinner too, which you can’t beat around the Holidays!